If you're on the go and need to maximize your charging capability, the NITECORE Q6 Six Slot Quick Charger is your choice. Capable of charging in six slots independently, this compact charger offers speeds up to 2A in a single slot to quickly handle the task. Compatible with a wide range of li-ion and IMR battery sizes, this simple to use charger is perfect for camping trips, car trips, air travel and of course, daily use at home. Drop your batteries in and go! The Q6 automatically identifies the inserted battery and applies the appropriate charging current and voltage. The easy to read display illuminates a red indicator light during charging and turns green upon completion. Internal safety protections prevent short circuits and overcharging and protects from improperly inserted batteries. The Q6 is also optimized for IMR batteries, ensuring an even charge throughout to extend the life of your battery. CHARGE UP TO 6 BATTERIES - Charge up to six li-ion/IMR batteries at once with the NITECORE Q6 Quick Charger. Compatible with many battery types including 18650, 16340 (RCR123), 14500, 18350 and more! SMART AND SPEEDY - Spend less time charging with speeds up to 2A in a single slot. Intelligent circuitry automatically identifies the inserted battery type and applies the appropriate charging current to maximize charging. An easy to read indicator light over each slot illuminates red during charging and turns to green upon termination. INTERNAL SAFETY PROTECTIONS - The Q6 has built-in safety protections to prevent short circuits and overcharging and can detect improperly inserted batteries. In case of an error, a red indicator light over the slot will blink to alert you. COMPACT FOR TRAVEL - Slim and streamlined, the Q6 is ideal for car trips, camping trips, air travel and daily use. If you've got a lot of charging to get done, the Q6 is ready for the task. 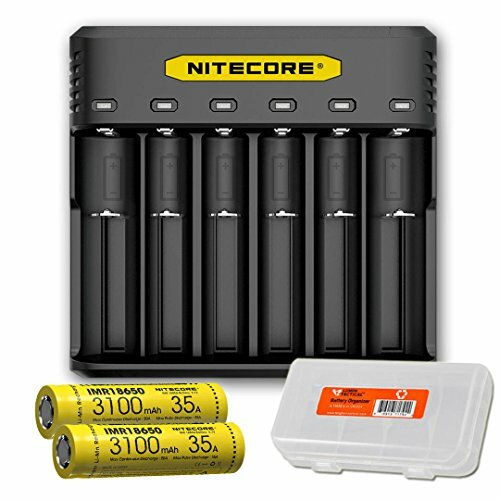 2 HIGH DRAIN RECHARGEABLE BATTERIES INCLUDED - This package includes 2 NITECORE IMR 3100mAh 35A IMR 18650 batteries that feature a long runtime. Complete package contents include NITECORE Q6 charger, 2xIMR 3100 batteries, and LumenTac battery organizer.